eXcalibrator is an aid for the astrophotographer to consistently obtain reasonably correct color in "pretty pictures." The program uses SDSS, Pan-STARRS or APASS data to analyze the star color in your image. eXcalibrator then computes color correction factors. The APASS data provide nearly full sky coverage in the northern and southern hemisphere. Pan-STARRS covers everything north of -30°. eXcalibrator versions >= 4.0 are faster and MUCH easier to use. If you have found the program too difficult, you may want to try the latest version. Download and unzip eXcalibrator_6_2.zip (3.83 MB) into your desired folder and create a shortcut for eXcalibrator.exe. Download and unzip eXcalEXE_6.2.zip (513 KB) into your current eXcalibrator folder..
Norton™ Antivirus users click here for special instructions. This version only downloads the less accurate NOMAD data and is not recommended for new users. With these data, about 30% of the eXcalibrator calculations are inaccurate. Some are very inaccurate. excalNOMAD is provided for pre-version 5 users who feel they must have access to the NOMAD data. Download and unzip eXcalNOMAD.zip (618 KB) into your desired folder and create a shortcut for eXcalNOMAD.exe. If you have any problems or suggestions please don't hesitate to email me. There is an email link under the Help menu. eXcalibrator Tips & Tricks. Using eXcalibrator with PixInsight. Descargar solamente el archivo de la documentación (.pdf). (3,02 MB) Versión 5.0. Lo sentimos, las porciones se traducen con el traductor de Bing. Versión 5.0. Lo sentimos, las porciones se traducen con el traductor de Bing. 6.2... Jan. 9, 2019 Bug Fix... PixInsight, version 1.8.6, introduced Astrometry Integration. By default, this appends 40K of data to plate solved images saved in the FITS format. EXcalibrator erroneously interpreted these as pixel data. This caused the program to incorrectly determine that some pixel values are greater than 1.0. Improvement... "FTS" is now recognized as a valid file extension for FITS images. 6.1... Aug. 2, 2018 Bug Fix... With SDSS-DR12 data using "eXcalibrator Classic" or the two SExtractor Calibration Methods, the progam was using out of range values for (u-g) and (g-r). Improvement... The SDSS-DR9 data are restored because of the slow (sometimes VERY slow) SDSS-DR12 downloads. Use DR12 as the last choice. The VizieR folks have confirmed that the DR12 downloads are slower. Improvement... Better database queries reduce the size of all SDSS downloads by 40 to 50%. Improvement... R, G and B are now acceptable filter names. 6.0... July 7, 2018 Added the Pan-STARRS1 (PS1) Survey. This 3Pi survey covers 75% of the sky... that is everything north of -30°. This is especially good news for everyone in the Northern Hemisphere. The data are aquired with a 1.8-meter telescope, at 10,000 feet on Maui. The PS1 records are a bit large. With the maximum search radius of 75', eXcalibrator may download 15MB of data. So just wait for it. Improvement... The SDSS-DR9 data are replaced with SDSS-DR12. This data release is the final update for the SDSS-III survey. Improvement... Better SDSS database queries provide smaller and faster downloads. been caused by a change in the data records. Bug Fix... The program had a low percentage of incorrectly matched SExtractor records. This caused insignificant, usually no, errors in the final RGB ratios. The new routine's absolute accuracy gives a lower initial standard deviation. 5.1... Dec. 2, 2017 Improvement... Added a CheckBox to relax the APASS data constraints. This allows usage of data with only one observation. See the Help Menu for more information. 5.0... July. 30, 2016 Improvement... Added access to the AAVSO Photometric All-Sky Survey (APASS) database. This gives about 90% sky coverage in both the northern and southern hemisphere. New Feature.... Added running averages for multiple telescope results. Improvement... The program now excepts any legal Windows file or folder name. Removed... access to the lesser quality NOMAD data. 4.36... Sept. 16, 2015 I forgot to update some of the internal program messages to match the current version number. 4.35... Sept. 16, 2015 Improvement... With 16-bit files, the required use of the keywords, BZERO and BSCALE is relaxed. If BZERO = 32768 and BSCALE = 1, or is missing, the file type is 16-bit unsigned. If BZERO = 0 and BSCALE = 1, or both are missing, the file type is 16-bit signed. Improvement... A few error messages were clarified. 4.30... Nov. 5, 2014 Bug Fix... Improved recognition of PixInsight (PI) data. With the use of some plate solving software, eXcalibrator was failing to recognize PI data. 4.25... Dec. 19, 2013 Bug Fix... EXcalibrator, version 4.2, had an embarrassing programming error. This resulted in a 0 to 15% error in the color correction for the green channel. The error occurred when using Source Extractor and files NOT saved with PixInsight. 4.2... Sept. 23, 2013 Improvement... The program now works with PixInsight 32-bit floating point and both 16-bit FITS files. 4.1... May 31, 2013 Bug Fix... eXcalibrator now correctly determines the vertical flip orientation with images plate solved by PixInsight. Improvement... The "Help" drop-down menu includes special instructions for using PixInsight 0.0 to 1.0 scaled data. 4.01... April 7, 2013 Minor incorrect error message... All references to "SDSS-DR8" are changed to "SDSS-DR9". 4.0... April 6, 2013 Improvement... eXcalibrator no longer requires manual downloading of NOMAD or SDSS data. This makes eXcalibrator faster and MUCH easier to use. Improvement… The calculated R, G and B factors may be normalized to any of the three colors. This is especially useful for PixInsight users. Bug fix… eXcalibrator now allows processing a new set of images without the need to reload the program. 3.2... Feb. 24, 2013 Bug Fix... The parse SDSS Data Routine is modified to read the recent changes in the Aladin SDSS-DR7 format. Improvement... eXcalibrator no longer downloads update info and general messages to the hard disk. They now loaded directly into memory. Sept. 16, 2012 Added the German documentation for version 3.0. June 21, 2012 Added the French documentation for version 3.0. 3.1... May 29, 2012 Bug Fix... Fixed a divide by zero error in the getBackGroundLevel function. 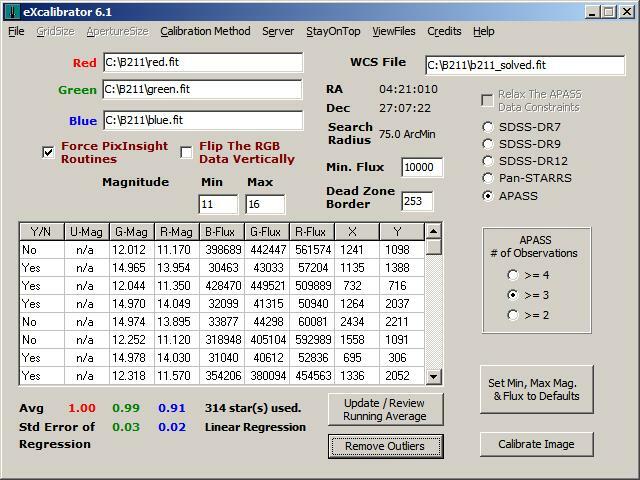 3.0... May 8, 2012 New Feature... A Linear Regression routine uses nearly any color SDSS-DR7 or DR8 star. In addition to being more accurate, the routine GREATLY increases the number of useful stars. This especially benefits those with a small FOV. Thanks goes to Bruce Waddington for his work on the LR routine. Improvement... In Aladin, the Excel format is now used for copying data to the clipboard. Improvement... A new version of SExtractor is 2 1/2 times faster. New Feature... A new Aladin filter is included to capture all stars to magnitude 20. 2.06... Jan. 22, 2012 New Feature... A message display system is added. This allows the broadcast of emergency information to the user when eXcalibrator executes. The message will display at program startup until the noted problem is repaired. 2.05... July 27, 2011 Bug Fix... eXcalibrator was not correctly checking for the absence of the FITS keywords CROTA1 and CROTA2. 2.0... July 18, 2011 New Feature... SExtractor is add as an additional star analysis method. New Feature... Added the Spanish translation of the documentation. Thanks goes to Felipe Largo. Improvement... eXcalibrator now allows 16-bit signed and 32-bit integer FITS files. Improvement... To avoid confusion, the plate-solved file is only loaded into the WCS File text box. In the case of using SExtractor, the program renames the text box to "Sum File." Bug fix... View Header correctly shows the header for the plate-solved file. Bug fix... The FITS keywords, BZERO and BSCALE, are no longer used for 32-bit files. This allows reading files created by MaximDL. 1.0.4.2... April 4, 2011 Fix for an Aladin bug... When running under the 64-bit version of Windows 7, Aladin drops the "VizieR" column in the NOMAD1 and SDSS-DR7 data. 1.0.4.1... Feb. 5, 2011 Bug Fix... The parse SDSS & NOMAD1 Data Routines are modified, again, to read the recent changes in the Aladin format. 1.0.4.0... Oct. 14, 2010 Bug Fix... The parse SDSS Data Routine is modified to read the recent changes in the Aladin format. Improvement... The program can now use any registered image to obtain the WCS data. Improvement... The NOMAD1 adjustment factors are now automatically applied. Special Note... See Appendix A for documentation on the above changes. This is currently only available in the English version. Check back in a couple of weeks for complete documentation rewrites. 1.0.3.0... Mar 22, 2010 Bug Fix... When using the "Use Local Background" photometry method, the program sometimes found no useable stars, resulting in a later floating-point error. An error message was added, suggesting input changes to find more stars. Improvement... Added more error messages. 1.0.2.0... Mar 13, 2010 No software changes... just added the French translation for the documentation. Thanks goes to Thierry SERIEYS for this work. 1.0.2.0... Feb 10, 2010 No software changes... just an organizational rewrite of the documentation into clearer setup and workflow sections. An example workflow was added, showing how to use eXcalibrator's results in an image processing program. Thanks goes to Neil Fleming for his work on this rewrite. 1.0.2.0... Sept. 1, 2009 On startup, eXcalibrator now informs the user if a program update is available. After downloading, it will be necessary to exit the program to unzip and install the new executable. It may be necessary to go to the web page to download a new documentation (PDF) file. Bug Fix... To avoid divide by zero errors, a Minimum Star Value has been added. The brightness for red, green and blue must all be above this value to include the star in the calibration. The minimum value is initially set to 50... anything less than 50 to 100 is probably too dim to be useful. 1.0.1.0... Aug 29, 2009 With 16-bit images, some programs place the value, 32767, in the FITS header for the keyword BZERO. eXcalibrator now looks for 32767 and 32768.